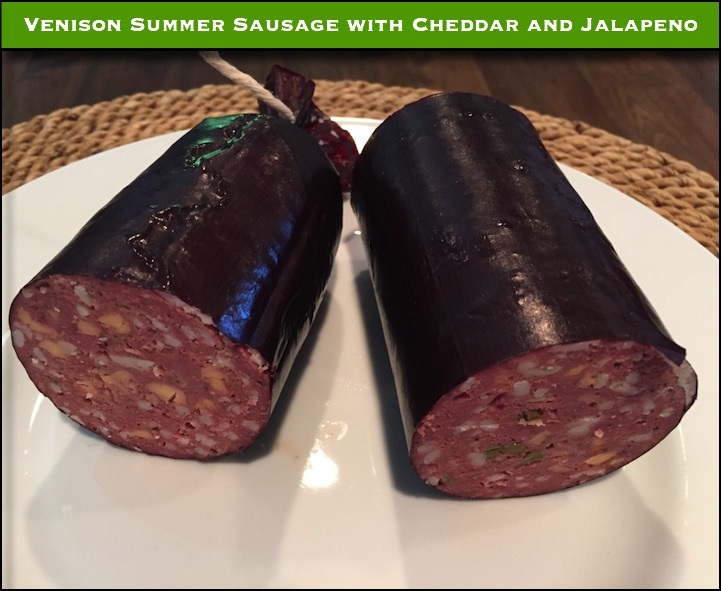 HomeRecipes Cured Venison Summer Sausage – Jalapeño and Cheddar, and Fat? Venison Summer Sausage with a little beef fat added. 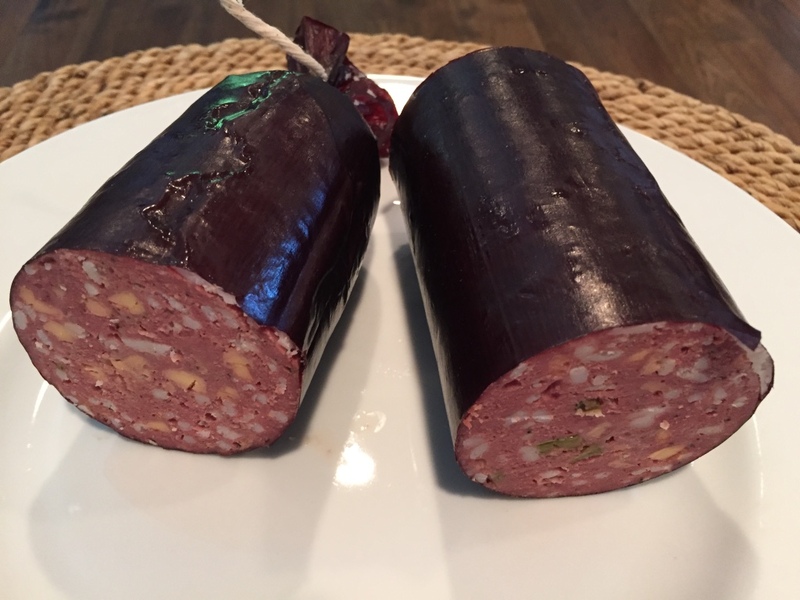 Normally I don’t add fat to my summer sausage, but read the note at the end for a little twist on the recipe. Fat. Venison doesn’t have much. That causes one of the main challenges to cooking it. Go too far and it will just be dry and tough. 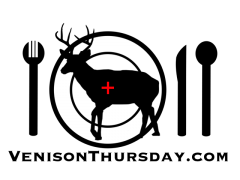 Many times, cooks (or processors) will add fat to venison. Has anyone ever told you about their amazing backstrap recipe, where they wrapped everything in bacon? Well, I would argue that is more of an amazing bacon recipe, and the steak was probably overcooked. Same thing for sausages and hot dogs. I’ve heard people tell me time and again how great venison hot dogs are. What I don’t think they know is that their “venison” dog is probably at least 50% ground pork. Same goes for any venison sausage. Personally, I like to avoid adding fat or even mixing other meat in with my venison. I prefer the purity, not to mention the fact that once you start mixing other meats in with your “free” venison, the cost of what you are making starts jumping. The general trend? If it’s cured, you don’t need to add any extra fat. That is doubly true if it’s cured and dried, like jerky. The rest of the sausages are more of a “fresh” sausage – which I find I make less of as time goes by. I love italian sausage – and I feel that nothing is better than a pure pork italian sausage. If I’m going to grind pork, why add venison in? It will just make it drier. If you are mixing venison with pork, my suggestion is to save your venison for recipes where it can stand on it’s own. So now, I’ll share a recipe that you can go either way with. 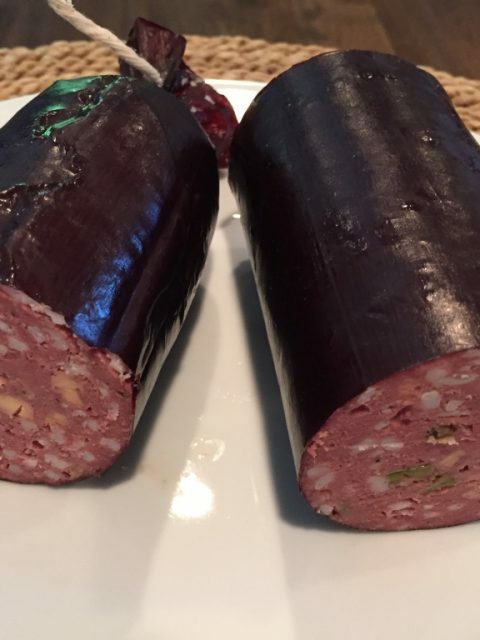 This summer sausage recipe is amazing with pure venison. But, as you see in the pictures, I added a little beef fat to it – and I’ll share why after the recipe below! Don’t worry if you you don’t have a smoker. If your oven can be set to 200 or lower, you can make sausage or jerky. Get your casing soaking in water. Chop up your jalapeños and set them to side. I like to run them through a food processor to get them nice and fine. In a small mixing bowl, add your water and instacure, and stir till dissolved. Mix the rest of the seasonings (not the jalapeño or cheese) in with the water, and mix thoroughly. Thoroughly mix the seasoning mixture in with your ground venison. Mix in the jalapeños and cheese. Stuff everything into the casing. I like to use a vertical sausage stuffer, but a jerky gun can work just as well. I actually have this recipe tailored so that everything will easily fit in my 5 lb stuffer without needing to do multiple batches. Tie off the casing, and let it sit in the fridge for 24 to 48 hours. After sitting, set your oven to 180°. If you have a remote thermometer, it will make your life a lot easier. 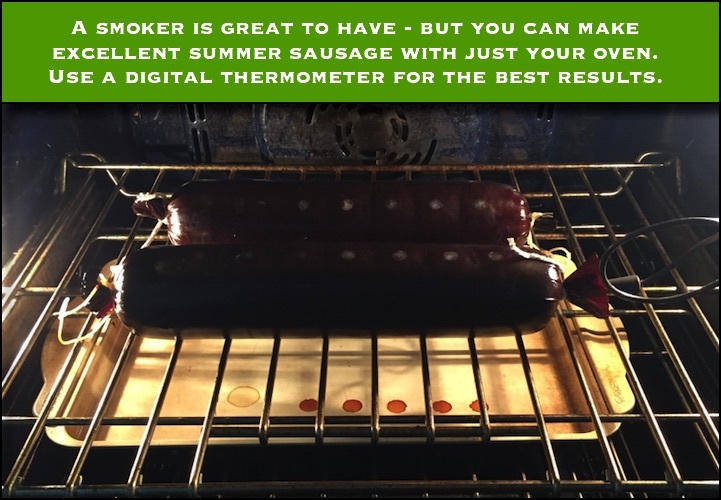 You need to cook the sausage till it hits 165° – so a remote thermometer let’s you keep an eye on it without ever letting the heat out of the oven. Once it hits 165°, pull it out and pop it in a ice bath till it gets down to about 80-90°. Let it sit at room temperature till it gets to room temperature – then it’s ready to eat. Slice into sandwich meat, or quarter up and freeze. Yeah, yeah, I added some fat. Only because I wanted to grill it! Ok, so now on to why I added some fat. Not JUST because I’m a hypocrite. Hey, isn’t everyone? So, what I did, was keep my venison to 3 lbs, and for the other ½ lb, mixed in some ground beef fat – which I have a ton of since we bought a half a cow this year. I saved this note for last, because for eating it cold, you want PURE venison, as I laid out in the recipe. The beef fat is a little waxy. If you add the beef fat, eating the sausage cold will not be a great experience. But, cut slabs about an inch thick, and throw them on the grill on high, or do a fast, hot pan sear, and you have an amazing hot sandwich filler! You could add hamburger, or ground pork as well to add fat in. I was just using ingredients that I had on hand – the real point is that if you are going to grill or sear the sausage in some way, you must add some kind of fat or the sausage will get dry. Even if you are pan frying it – butter or oil will do – but in my case with the added beef fat, I don’t need to add anything to the pan other than the sausage! 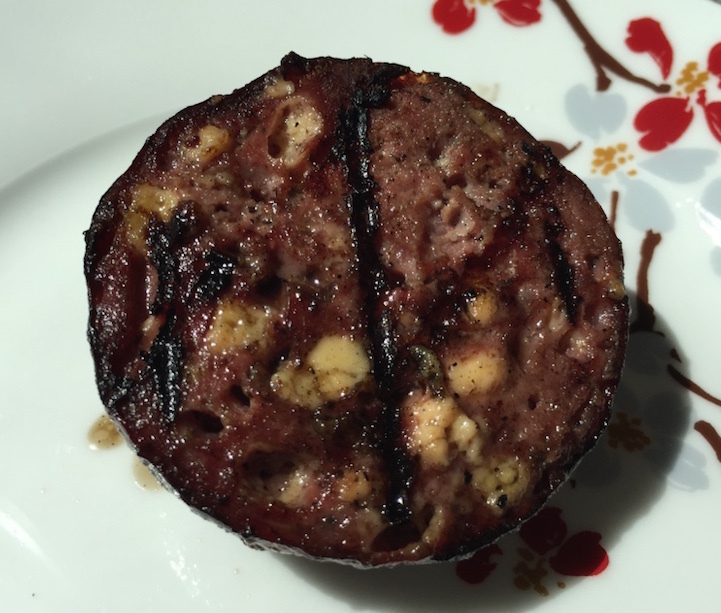 Once grilled or fried, use it like you would a grilled hamburger, or, throw some sauce on it and stick it in some baked garlic bread with mozzarella cheese for a fantastic summer sausage parm!